Art Basel and BMW continue their project to recognize and support emerging artists worldwide. 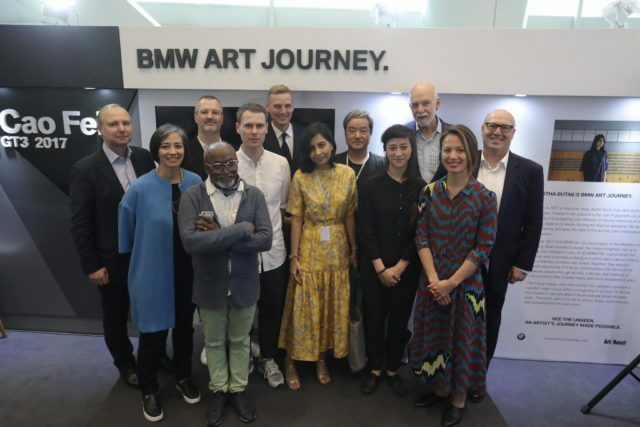 Its next step was the announcement of the shortlist for the next BMW Art Journey during this year’s Art Basel in Hong Kong. Like a mobile studio, the BMW Art Journey can take artists almost anywhere in the world. The initiative gives them an opportunity to develop new ideas and envision new creative projects. Kazim (b. 1979) lives and works in Lahore, Pakistan. He received his Master of Fine Arts from the Slade School of Fine Art, London. Ali Kazim forms multi-layered compositions, creating uniquely textured paintings. They include elements of narrative and fantasy. 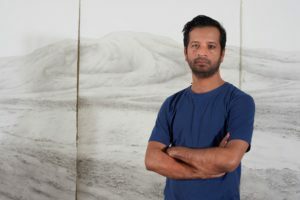 He works in watercolour and graphite, using techniques acquired from studying the watercolour wash and miniature painting techniques of the Bengal and Mughal schools. At this year’s Art Basel show in Hong Kong, the artist presents an immersive installation. It draws a primary inspiration from the landscape around his hometown of Lahore. Kazim will participate in the 9th Asia Pacific Triennial of Contemporary Art, opening in November 2018 in Brisbane. Langdon-Pole (b. 1988) lives and works in Berlin, Germany. He studied at Elam School of Fine Arts, Auckland and at the Städelschule, Frankfurt. In his work he uses paper nautilus shells, fragile egg-case-shells, made by the genus of Octopedes known as Argonauts, and unique fragments of Meteorite handcrafted to fill the shell’s aperture. He is presenting an installation of new sculptures that form a poetic exploration of identity and belonging. 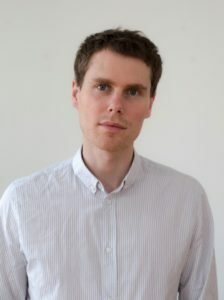 In 2017, Langdon-Pole received the Ars Viva Prize for young artists living in Germany. 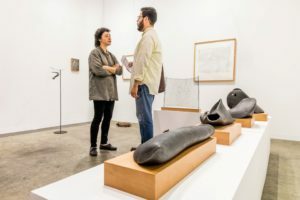 Recent exhibitions include Between Bridges, Berlin; Ars Viva 2018, Berlin; S.M.A.K. Stedelijk Museum voor Actuele Kunst, Ghent and Kunstverein München, Munich. Porras-Kim (b.1984) lives and works in Los Angeles, United States. She has a Master of Fine Arts from California Institute of Fine Arts as well as a Master of Arts in Latin American Studies from the University of California, Los Angeles. Her work questions the social and political contexts that influence the manifestation and interpretation of language and history. Porras-Kim’s artistic approach comes from a research-based practice. That practice aims to reconsider how intangible subjects have been represented in the fields of linguistics, history, and conservation. She is presenting a group of artefacts that reconstruct and reimagine ambiguous historical fragments from various ethnographic institutions. Her work was displayed at solo exhibitions at Commonwealth and Council, Los Angeles and LABOR, Mexico City. 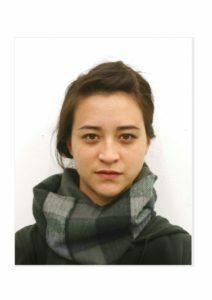 Recently she has been included in group exhibitions at Seoul Museum of Art and Whitney Museum of American Art, New York. These three shortlisted artists are now invited to develop a proposal for their ideal journey. 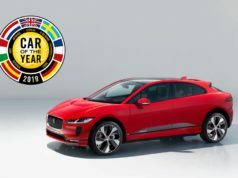 The announcement of the winner will be in the early summer of 2018. The three artists received unanimous approval from the jury. The jurors noticed a wide search for narrative with a mostly consistent search for ‘fact’. The number of eligible galleries was by far the greatest in the project. And these represented artists of the most diverse backgrounds. There were different aspects of the artists who the jury chose for the shortlist that impressed its members. In Kazim’s work that was his meditative approach to the desolate landscape of Pakistan as well as labour-intensive process combining miniature painting techniques with a contemporary sensibility. Langdon-Pole stood out with a poetical and surprising combination of materials. Porras-Kim made a unique investigation into the ways in which objects within institutional collections undergo re-interpretation via changing social and physical contexts. 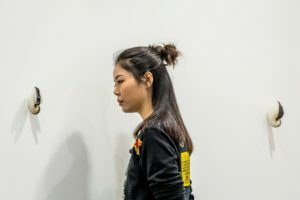 The 2017 winner of the BMW Art Journey from the Discoveries sector was Astha Butail who, during this year’s Art Basel show in Hong Kong, presents insights into her project “In the Absence of Writing”. The BMW Art Journey is a collaboration between Art Basel and BMW, created to recognize and support emerging artists worldwide. 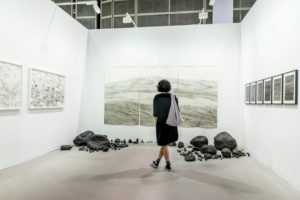 This unique award is open to artists who are exhibiting in the Discoveries sector during Art Basel in Hong Kong. One of the latest projects is a concert of the London Symphony Orchestra and 50 young musicians at Trafalgar Square in London. It will happen in the summer of 2018. But right this spring there will be concerts from the BMW Welt Jazz Award 2018. Norwegian ensemble Beady Belle will perform on April 8, Austrian duo BartolomeyBittmann progressive strings Vienna on April 22. Cao Fei’s work of is a reflection on the speed of change in China as well as on tradition and future. She pays tribute to Asia’s ancient spiritual wisdom as it swiftly spreads into the third millennium. The multimedia artist built a parallel universe with this art project. 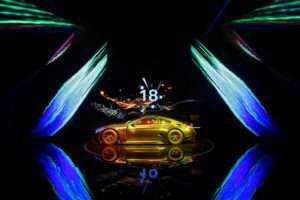 The 18th BMW Art Car had its world premiere on 31st May 2017 at the Minsheng Art Museum in Beijing. The work consists of three different components. One is a video focusing on a time travelling spiritual practitioner. Then there are augmented reality features picturing colourful light particles. And last, the BMW M6 GT3 racecar in its original carbon black because the car is still the central object. Cao Fei’s implementation of video art, as well as augmented reality, creates an environment in which the M6 GT3 is an essential part. In her video work, she executes spiritual movements, which echo in colourful streams of light. 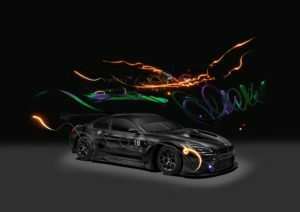 When the special app is used within the premises of the car, these light swishes become an AR installation floating above and around the BMW M6 GT3. This way the project involves the spectator. 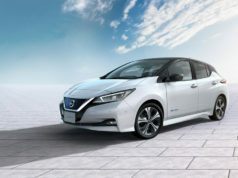 This narrative reflects on a traditional spiritual ceremony very common throughout Asia in which new objects such as automobiles go through a blessing, in this case wishing good luck to car and driver. On a broader level, the light elements mirror what the eyes cannot see and the mind cannot picture. The jury defined the project “imaginary, even fictitious, but then on the other hand very concrete and physical”. 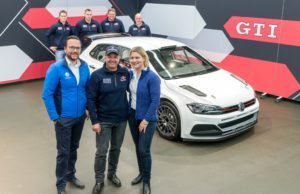 Cao Fei took part in a racing experience with female race driver Cyndie Allemann in Switzerland while also working closely with BMW Group’s engineers, designers, and digital specialists. The artist also went on an extended BMW plant visit to Tiexi.